However, what iTunes doesn’t seem to easily let you do is combine “and” and “or” conditions. For instance, assume you want a playlist of all your hard rock music, grouped by the decade in which it was recorded. You classify your hard stuff into two genres—Rock, for the hard-yet-still-civil stuff, and Heavy Metal for the headbanging ultra-loud guitar-slamming good stuff. You have a large collection in both genres, and you’d like to use Smart Playlists to group the tracks by the date they were recorded. At first glance, this might appear to do what we’d like it to do, but it really won’t. Since the Match pop-up is set to “Any,” you’ll end up with a much broader Smart Playlist than you intended—it will include all songs whose genre is Rock or whose genre is Heavy Metal or whose year recorded was between 1990 and 1999 (regardless of that song’s genre). Setting the Match pop-up to “All” won’t work any better, as the Smart Playlist would then have to find songs that have all three characteristics, which is highly unlikely. So just how can you create an “extra smart” Smart Playlist? The answer turns out to be relatively simple—take advantage of iTunes’ ability to call one Smart Folder as a condition of another Smart Folder. To make this work for the example above, first create a Smart Playist with the Match pop-up set to Any, and then add two rules, one each for the Rock and Heavy Metal genres. 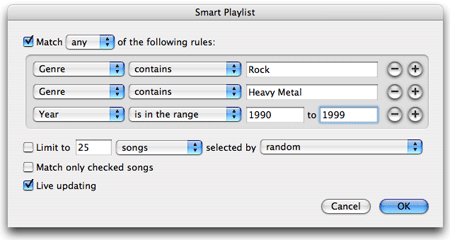 In other words, your finished Smart Playlist will look like the screenshot above, but without the final Year rule. Call it whatever you like; I tend to use names that let me know the playlist is part of a larger playlist (i.e. 90s Rock Part 1). Since you’ve set the condition to All, the only songs that will be included are those in the 90s Rock Part 1 playlist (i.e. those with Rock or Heavy Metal genres) and whose date recorded is between 1990 and 1999. 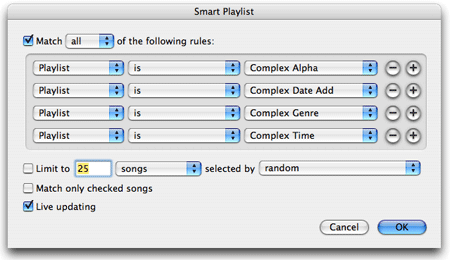 There you have it, a Smart Playlist that combines both “or” and “and” rules to enable more complex selections. The resulting playlist will only contain songs that appear on all four of the referenced playlists, which means that those songs met the complex selection rule set out above. Obviously, this is a contrived example, but it does help demonstrate some of the power you can access by combining multiple Smart Playlists. Although it’d be nice to have more complex options built into the standard Smart Playlist feature, this is a pretty good workaround.